Upcoming. The Titles are obvious and worth browsing. Here’s what we all want. Have a great time at school. lead a life of awesome. This is the gamechanger for empowering our entire society with the spirit, skills and shared goal of creating a world of peace, bliss and abundance for all. With High Impact Student Clubs at each and every school, the future will be fine. There’s students, teachers, parents dreaming of this at every school! Start with yours, and those around you. Fiercely document and share your actions to activate others. and justification to legally bound children to attend school, is to nurture able, active citizens of a libertarian democratic society, which today also has to be sustainable, in a peacefully collaborating global family of nations. Adults are grossly failing. Also continents with 100% schooling, like North America and Europe, with big fat financial resources and decades of replacing frontal teaching with collaborative, brain-proof learning methods, are grossly unsustainable! They experience unprecedented allergies, 50% cancer, epidemic depression, bullying, suicides, mobbing, crime, escalating rise of violence. Even financial prosperity is eroding, biodiversity is vanishing at record pace, water and soil degradation are reaching tipping points. Not even consumption and trash are decreasing. This tells us that what’s been taught and learned at schools for the past 40 years is not sufficient. Far from it. The UNITED NATIONS Decade of Education for Sustainable Development DESD 2005-2014 meant to upgrade learning culture globally to help youth to learn to survive and thrive in the 21st Century. Yet – few schools have upgraded, many don’t even know of the Decade. Ministries and teachers are failing their purpose. We can no longer wait for administrators that have grown up with colonial mindset, and are way behind. Today’s teenage heroInes embody these skills to the fullest, are showered with our societies’ highest awards, celebrated as heroInes in media, recognized as ultimate role models, and speakers at schools. They embody the model of the able, active, caring citizen of the next level collaborative democracy that we need to avoid a scorched planet in our lifetime, or at least survive in functional, resilient, thriving regions. All our youth have the right to evolve this spirit and skills. The heroInes say we all have it in us. Easy. 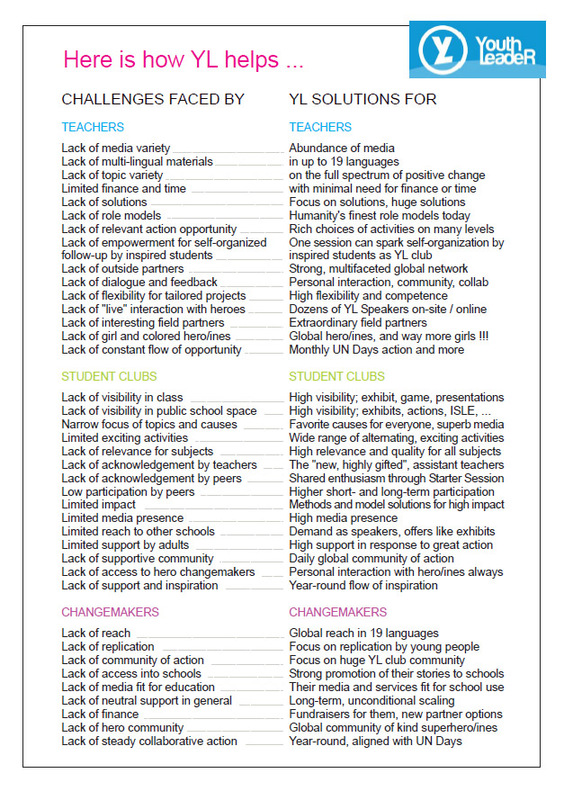 Until schools are able to deliver this new learning culture formally in the classroom, which won’t happen soon, youth have the right to learn it via youth-powered Informal Sustainability Learning Environments ISLEs – in real-time collaboration with th proven and finest of their and adult generations, today’s Einsteins and Gandhis. Thousands of schools have already made student-powered service-learning part of learning culture. Now, we upgrade it with social entrepreneurship, social business and responsible citizenship. This is our right as students, citizens, teachers, and taxpayers. Because also the future of all us adults depends on it. Today’s adults can not evolve these skills at relevant scale and pace. Just like monarchists could not. But the young can, by growing up with it daily, for their ten formative years. The one and only place for this is school. It’s what it has been invented and is paid for. We declare our commitment to make it true, and demand the full support of the school board.